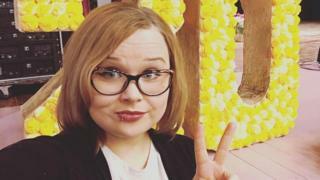 A self-styled Russian campaigner for morality in schools has boasted about the dismissal of a teacher he describes as a "lesbian" and "satanist". "Another school purge of an LGBT teacher," Timur Bulatov wrote on Russia's version of Facebook, called vKontakte. He professes to be fighting decadence because he is a pious Muslim. He sent a dossier on music teacher Maria Shestopalova to her school bosses in Krasnoyarsk, Siberia. She says they then forced her to quit. Ms Shestopalova, 21, told the BBC she had been summoned by the heads of Krasnoyarsk Further Education Centre No 4 immediately after Mr Bulatov's denunciation of her. "Without understanding the situation properly the director rang me on Monday evening and said, very unpleasantly, that she was expecting me in her office at 9:00am on Tuesday, and advised me to tender my resignation," she said via vKontakte. She said they spent six hours questioning her and applying pressure by citing the reputation of the school, the other teachers and her parents. She resigned after that, she said. "Evidently they had no desire to establish who was right and who was wrong. Having decided that this solution would be easier for them they pressurised me, to make me quit." She said the school had sent a letter to Mr Bulatov immediately after the meeting, telling him that she had been fired. She told the BBC that they had treated her "like a child - it was simply inhumane". School director Olga Etsel, interviewed by Russian news website Meduza, denied Ms Shestopalova's allegation about psychological pressure. And she said the meeting had lasted 90 minutes, not six hours. A Russian law passed in 2013 controversially banned the spreading of "gay propaganda" among minors. Reports say the Russian interior ministry is investigating Ms Shestopalova's behaviour. Mr Bulatov condemned her for wearing lip and ear piercings and for "supporting LGBT sexual deviants and promoting homosexuality". He wages his "morality" campaign from St Petersburg. On vKontakte he claims to head a movement called "First Moral Russian Front". He calls himself "Timur Bulatov (Isaev), social activist". Ms Shestopalova accuses Mr Bulatov of hounding her from her job. She says he heaped abuse on her in a telephone conversation, and she is now taking legal action against him. Russia's ban on "gay propaganda" angered human rights activists and the international gay community. The law suggests that homosexuality - described as "non-traditional sexual relations" - is alien to life in Russia. Many homophobic attacks have been documented in Russia. Mr Bulatov told Russian news website Tayga.info that he had "rescued" Russian children from 65 "immoral" teachers. On his site he posted the 31-page dossier on Ms Shestopalova, with a long message denouncing her. "This teacher clearly does not meet the standards of her profession and can harm her pupils. We demand that Maria Shestopalova be sacked for amoral behaviour," he wrote. Ms Shestopalova said she had worked at the Krasnoyarsk school for five years, for a salary of about 8,000 roubles (£107; $131) a month.